Asteroid 2012 LZ1 is roughly spherical and rotates once around every 10 to15 hours. This detailed image was taken on July 19, 2012 by researchers at the Arecibo Observatory in Puerto Rico, when the asteroid was 6 million miles (10 million kilometers) away. The resolution is 25 feet (7.5 meters), equivalent to seeing a basketball in New York City from Puerto Rico. A massive asteroid that zipped by Earth last week is actually twice as large as scientists originally thought, new radar images of the behemoth space rock reveal. Asteroid 2012 LZ1 sailed within 3.3 million miles (5.3 million kilometers) of Earth at its closest approach on June 14. Since that distance is roughly 14 times the distance between Earth and the moon, the oblong-shaped asteroid 2012 LZ1never posed a threat of colliding with our planet. But the flyby did allow astronomers to train the planetary radar system at the Arecibo Observatory, a huge radio telescope in Puerto Rico, on asteroid 2012 LZ1 and find that its size was seriously underestimated. 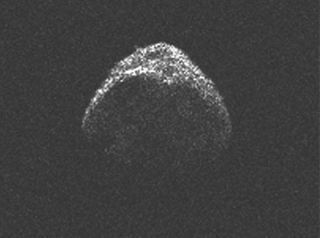 "This object turned out to be quite a bit bigger than we expected, which shows how important radar observations can be, because we're still learning a lot about the population of asteroids," said research team member Ellen Howell, of the Arecibo Observatory, in a statement. Such a massive object would likely have serious global consequences if it hit Earth, the researchers said. But the radar measurements showed that the object does not have any chance of hitting Earth for at least the next 750 years, they added. "The sensitivity of our radar has permitted us to measure this asteroid's properties and determine that it will not impact the Earth at least in the next 750 years," said Mike Nolan, director of planetary radar sciences at the Arecibo Observatory. Scientists at the Arecibo Observatory observed the asteroid on June 19 to map its orbit more precisely, and to determine its size, rotation rate and shape. The newfound asteroid was first seen on June 10 at the Siding Spring Observatory in Australia. Since the near-Earth object was detected less than a week before it flew past the planet, astronomers only had rough calculations of the asteroid's measurements at the time. When 2012 LZ1 was first spotted, it was classified as a potentially hazardous object because its preliminary orbit brings it relatively close to Earth — with 20 times the distance between Earth and the moon. Since 2012 LZ1 flew past outside the orbit of the moon, it could not be seen by amateur astronomers through backyard telescopes. But, several scientists trained larger telescope eyes on the space rock as it soared past. The Slooh Space Camera, which broadcasts live views from telescopes around the world, also streamed footage of asteroid 2012 LZ1's flybyfrom a telescope in the Canary Islands, off the west coast of Africa. Researchers have long been keen to protect the planet from collisions with space rocks. Over the course of its 4.5 billion-year history, Earth has been pelted by asteroids repeatedly, in some cases wiping out large percentages of life on the planet. To gauge the impact threat, NASA astronomers and scientists around the world regularly monitor the night sky for large, near-Earth asteroids that could pose hazards to the planet.